Part of the story I wanted to tell in Enjoy the Game was how Elton John, Graham Taylor, the board of directors and staff built a football club, not just a football team. As the players took the club from the Fourth Division to the First in five years the club had to keep up. The ramshackle old stadium needed a lot of work and I knew that Eddie Plumley, who joined the club in 1978, would be able to talk about what it was like building up the club. I travelled down to his home in Sussex and we sat and had coffee and he gave me a lot of very interesting background detail that I would call on when writing the book. What was it about Watford that persuaded you to drop down to the bottom division? I was general secretary at Coventry City and Watford advertised for an executive manager. I hadn’t seen the advert, and I hadn’t a clue what an executive manager was. I was chairman of the secretaries and managers association, which was the collection of football club secretaries and chief executives and senior management. Bertie Mee [Watford’s assistant manager] was in that and he came to see me in the November time when they were already making a good fist of getting out of Division Four. He came to ask my opinion. They wanted someone to run the administrative side. They had Ron Rollitt as company secretary but they wanted an executive manager to take on a senior role working with the board, the chairman, the manager. I said, ‘I don’t like the title.’ I wasn’t sure they’d get the right person with that title. Bertie asked me if I could recommend someone. I don’t think they were struggling to fill the post, I think they were struggling to find the right person. He said, ‘We’ve had over a hundred applications, but there’s nothing that hits us between the eyes.’ I said well, give me time to think about it. I met up with Elton. He knew of me, but he didn’t know me. After some long talks I could see they were going to go places, no question about it. 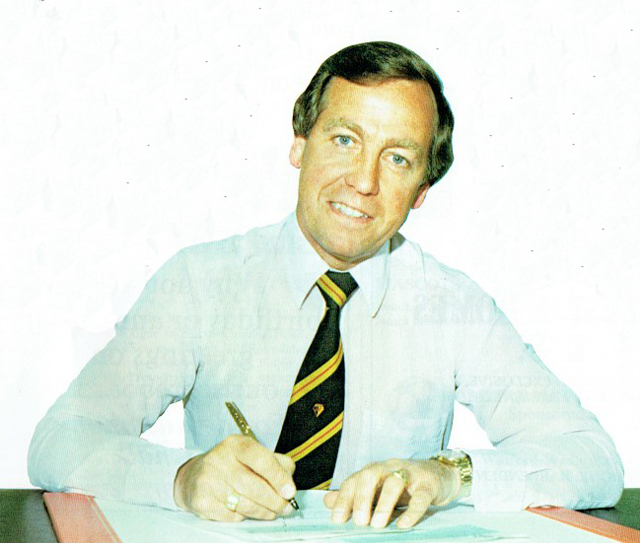 He was a winner and he was determined to put in place a group of people to get Watford to the First Division. There was no hiding their ambition – they wanted to be successful. You could tell that Elton, Graham and Bertie were looking for the last piece in the jigsaw. That may sound a bit big-headed and I don’t mean that at all, but they wanted to get on with matters on the pitch and they needed someone to knit everything else together, try to improve the stadium, build the club up. 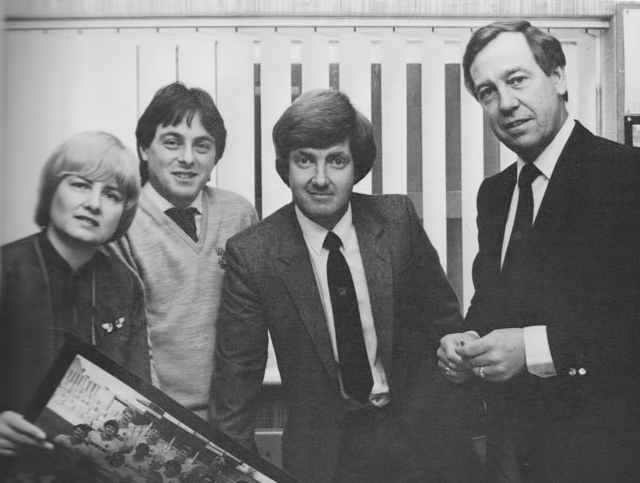 The job was to look after everything on the administrative side and legal side, and to work for Graham Taylor, who was called general manager. It was virtually everything but the football, but I had played professionally [as a goalkeeper for Birmingham City], so I had the knowledge of a football club and knew how it worked. I’d done all the jobs so if it was the maintenance man, or the ticket office girl, or a player coming in, I could deal with it. I suppose I was quite a good guy to recruit in that sense because I knew how all aspects of a football club should work. I liked what I saw, except the ground. I always said that I inherited a corrugated graveyard. That was how I saw it when I drove down Occupation Road. How did it go initially because the team was improving quite rapidly and the rest of the club had to keep up. I was due to start on January 1  but I got hepatitis and didn’t start until three months later so by the time I really got to work we were in Division Three. How did you decide what needed to be done first? I just got on with things as they came up. There was a lot to do and it was a full-time job and a half at times but I remember when I was at Coventry the stand had burned down and I had to rebuild that in the time I was there. I had a lot of admiration for what Jimmy Hill [Coventry chairman] did. He had a phrase, ‘If you give a busy man a job, he’ll do it,’ and that’s how I saw myself. I was never still. When I got to Watford in the April there was no question that about it, they were going to go up into the Third Division. The next year they went into the Second Division, so from my point of view I’d been in all four divisions in under two years. What was your relationship like with the key people, Graham, Elton and Bertie? It was very good right from the start. Graham really was terrific. He had some amazing principles. Bertie was amazing. I know Graham nearly fell off the chair when he rang up and said he was available. Elton had the time to be involved at the start. Just before it all took off, he made a decision not to go on the road for a while and for the first couple of years he was always around the club. He had so much passion for it. His manager John Reid was on the board as well. They were in the music business and John, as Elton’s manager, encouraged him to go back on the road eventually because they needed the turn-over in order to provide funds for the football club. But the football club was always Elton’s passion even when he was in the United States on tour. Elton travelled more in the lower divisions. He missed a year or so in the Second Division because he did this world tour, and then he was around when we got into the First Division. The first years he did go around the likes of Rochdale and Shrewsbury and by the time we got to the First Division we were ready to welcome the big clubs. I knew the protocol when the Evertons and the Arsenals came to Vicarage Road. It was great to put something on for the visiting directors. To be involved with the top brass in the First Division was quite special. Bertie and I were able to use our expertise in that sense, so it was magical. The team was successful but the rest of the club had to keep pace, I guess. That’s right. It was fairly obvious the team was outgrowing the infrastructure. That’s really where I was coming into my own. We did have a very poor stadium and the higher you went, the more it was necessary to develop the stadium. The Shrodells stand had to come down [in 1986] because of the regulations. It was all wooden and after the terrible fire at Bradford we had to replace it. Before that there was the question of testing [crush] barriers to conform with regulations. I remember the first piece of barrier tested was on the Vicarage Road terrace. The FA had sent some people down and they had a look. Then this team of engineers came along and the put the strengthening thing on and wound it up to check the tension. I went back to the office. No more than ten minutes later a guy came in. We tested the first barrier and it just pulled it straight out of the concrete. He said, ‘You’ll never play on here again if you’re not careful.’ So we had to replace all the barriers. I can’t remember the figures, but at the time it appeared to be fortunes. Graham, myself and Bertie would sit down with Elton and John Reid. Graham would say, ‘I need three or four players.’ And I’d say, ‘Well, we need new terracing or turnstiles,’ or whatever it was. Each time we went up a division, something had to be done to the ground. The one thing that never got done was the main stand, which is still there [as it was in 2009 when we were talking]. Most of the stand was timber. The dressing room area was okay because it wasn’t timber but the boardroom and all the rooms underneath and the Vice-Presidents club were virtually condemned by the fire officers We had to do something underneath the seats to fireproof it. The whole under-side of the stand had to be sprayed with this stuff. I can’t remember how much it cost, but it was a decent midfielder’s worth. Around that time wasn’t there a suggestion the club could leave Vicarage Road and build a new stadium? There were a lot of plans at the time – to either bring Vicarage Road up to scratch or go somewhere else, or even rebuild on the Vicarage Road plot. There was the idea to redevelop and to take the whole main stand back so it was over Occupation Road, but I never saw a drawing which excited me. Weren’t there plans to team up with a supermarket at one point? There was. The obstacle was the local authority and the allotments themselves that are behind the Rookery end. To relocate the allotments from the bottom of Occupation Road was beyond the local authority. They had to provide a certain number of allotments in the borough but they couldn’t find a site for them so that was a no-no. When I first came to the club in 1978 there were already discussions going on about relocation. From memory they came up with nine different sites all around the town and the surrounding area. There was a document itemising them with all the pros and cons. The simplest and the best for the football club was to move down onto the allotments. We wanted to move the stadium a couple of hundred yards but there were so many objections. I think one of the things was that we talked about it being a 35,000-capacity stadium, but certain members of the council thought that was grandiose. They thought it was too big for the club at that time but, of course when we got to the First Division we could have filled that capacity. But in the end, they weren’t able to release that allotments for us to build on so we were stuck unless we considered other sites. There was the golden triangle between the M1 and M25 that had been identified. Another up in Leavesden. One down where the big supermarket [Tesco] is now. What was the supermarket plan? I’d met various developers and got them on side and one big chain store was Sainsbury and another was Asda. They were both interested. Again, the local authority said that would affect the high street. They said, ‘Well, we’re sorry, we’re never going to go along with that.’ They said they couldn’t have shopping out of town because it would kill the high street but it wasn’t long before that did happen in Watford and supermarkets were built out of town. We didn’t really get any co-operation from the planners or the council. I don’t think they really wanted the football club to get bigger. There wasn’t a lot of political support for football as a whole at that time. They just thought of hooliganism, a lot of them. But they didn’t recognise what we were doing, working in the community and trying to make Watford a place that welcomed everyone. And it was frustrating. The allotments should have been a runner. We would have had an all-covered stadium; not all-seater, but all covered. There’d have been a indoor sports hall which would have been a public facility as well. We had the backing of Elton but also commercial partners and it could have been quite groundbreaking at that time. Weren’t there also talks about moving out of Watford? There were threats to move out of the borough but no one at the club wanted to do that. It was our frustration with the council that meant we felt we had to say that. We really didn’t get any support from the authorities. We made the decision that if we’re not going to go we had to make the best of what we had. We realised the only way to progress was to get a stadium that was going to be fitting of where we all wanted to be. When I came in, the talk was of getting to the First Division in ten years, but it was actually five, so it all happened a lot quicker than we’d really anticipated and we were always racing to keep up. The stadium was a bit embarrassing, I must admit, and it was a damn shame. How can you tell now whether we’d have attracted more people to the stadium if we’d redeveloped? How can we know what the effect would be? At one point there were plans for a roof over the Vicarage Road end but the Shrodells stand became a more pressing situation and that had to be replaced. Graham wouldn’t have a covered bench for the managers until there was roof on the Vicarage Road end. He thought that if the supporters were prepared to stand out in the rain then he would get wet too. It took a long time to get permission for that roof but then there was the Bradford fire and we were being told privately that the Shrodells would have to come down and be replaced. Although the facilities were modest, there were some attempts to make the ground more attractive. There were innovations like the electronic scoreboard too. But when you got to the First Division did you feel people looked down their noses a bit? I don’t think they looked down their noses but we obviously didn’t have the best stadium in the country. We made the very best of what we had. We were proud of it and we wanted the ground to look nice so we did what we could to tidy it up and make it look nice. We replaced corrugated iron with more attractive materials, we painted everything so it looked neat. We wanted the place to look its best. I think what Graham did with the benches was absolutely spot on and the mark of him as a man but some managers from the big clubs couldn’t believe there wasn’t a covered dug-out. I remember when Manchester United came and Ron Atkinson had these very nice shoes on and he realised he had to walk across the very wet grass to go and sit on the bench. There was a moment when he balanced on the edge and you could see him thinking about it, whether to take that step. The guy was called Levison and he was from a company in St Albans. They’d put in a strip scoreboard at QPR but they wanted somewhere they could put in a big scoreboard and Watford said yes. I had no problem with it – it was quite innovative at that time. They came up with the little jumping men that would jump up and down when we scored. I thought that was very clever. I remember someone cut through a cable one day and it didn’t work. It was operated from press box and the guy who ran it used to sit up there. But we had difficulty controlling him on match days sometimes. There were one or two messages that went up there that were not exactly Watford FC’s idea and I know Graham and I had to take him up about this. Oh I don’t know, things like, ‘Let’s hammer them,’ things that weren’t really what we wanted to be up there. I seem to remember something about the referee needing glasses going up there. [Laughs] I think we thought that the messages should be pro-Watford and not anti-the opposition. Put up, ‘Come on Watford,’ or ‘Come on you Hornets,’ but not something that might wind up the away team. Eventually we bought it for a few thousand pounds and ran it ourselves. The ground was homely rather than intimidating to the away team though, wasn’t it. It was never a cauldron but it could get going, particularly for evening games. What I remember was looking at that terrace that went all the way round and when it was full it was quite a sight. The European games were terrific for the atmosphere and when you think of where we’d come from it was a ground we could be proud of, even if it wasn’t the biggest and it wasn’t all covered. The likes of Jim Harrowell and Muir [Stratford] and Geoff [Smith], their football was third and fourth division football. That’s not being snobbish, but most of them were just open spaces. Some of those grounds were unbelievable. We wanted the finished article and it was a bitter pill to swallow when we were told by the local authority they could not help us. But we spent a lot of money on the facilities. Whatever Elton made available for players, he also made available to develop the club. What about the club’s badge, which was also updated shortly after you arrived. We didn’t have a corporate identity when I came. The only thing we had when I arrived was the old hornet. I hated it. It was on letterheads and everything and I just didn’t think it gave the right impression. If you were writing to the club’s solicitors or the bank about something and it had a cartoon hornet on it, was that the impression we wanted to give? We got a firm from London to re-design the badge. We wanted a bit of class brought to it, and I think we did. It wasn’t cheap, I know that. The brief, really, was change. We wanted to get away from the old. It’s always very difficult that but some things have to change and I think the badge had to change. We went with the hart, which had been on the badge in the past. Not everything can be changed though. I remember when a person came in and said, ‘Do we have to have that tune every time we come out?’ But from my point of view that was part of Watford FC. Was that Dave Bassett and Z-Cars you’re referring to there? Yes, that was something that I think was part of the identity. It had been going since before Graham came in and he kept it. The badge was different because it was something that projected an image of the club. I went to see the design company [in London] and gave them a brief. It was costly but the letter headings were embossed and suddenly we looked a lot more professional. Was there a range of designs to choose from? Is there an unused Watford badge design out there? I don’t remember having a choice between different designs. They presented that and we were happy with it. It’s a very simple design, but it’s very striking. It introduced the red as well and I think that gave us an identity that was different, modern. What else did you look to change? I wanted to review everything – look at absolutely everything in order of importance and make changes where necessary. Not everything needed changing but a lot did. When I came in 1978, I found the programme was being printed and produced outside of Watford. I thought that our programme should be printed by a Watford company, especially as Watford was famous for its printing industry. So in my innocence, I went to the Sun Printers and spoke to them. They laughed, they said you want a jobbing printer. We were far too small for them. They were used to printing hundreds and hundreds of thousands of things. They told me about a firm called Alpine Press, said they were nice guys. I went to see Maurice Grainger and they did the programme for over 30 years. In the early days we had to buy all the kit. We used to get it from Peter Spivey. It was all Umbro kit but we’d go to the Peter Spivey kit and order what we wanted and it would turn up and we’d get the numbers stitched on the back. Later on we had a kit sponsorship deal with them and we got everything we wanted and more but at the start you got a set amount of kit and that was it for the season. First thing I thought was, ‘Christ, what’s wrong?’ I was in a bit of a panic because I couldn’t think what he was ringing me about on the morning of the cup final. And he said, ‘It’s been fantastic, let’s hope we can finish it all off today.’ He then said he had something for me, and that he’d give it to me later tonight. I came off the phone and I was crying. It was amazing that he rang me to say that. It was the emotion of the whole day, of what we’d all achieved. Anyway, Elton wanted to do the party at John’s [John Reid] place, which was unbelievable. That evening Graham gave me a team shirt with the embroidery on it. ‘FA Cup Final 1984 Wembley’ stitched underneath the badge. I’ll never forget that. He didn’t have to do that but he organised for all of us [staff] to get a shirt. We’ve skipped forward a bit but what else do you remember about the cup final? Elton dismissed the idea of doing a cup final song straight away and he was absolutely right. He was one of the world’s most respected musicians and to do a gimmicky cup final song would have been all wrong. We all went down to the stadium on the coach. For the cup final the FA put on a lunch at Wembley. Everybody who is in the third round gets two invites for the chairman and his wife, so every club is represented at that luncheon, as were all the senior management of the two clubs and their wives. It’s a splendid occasion. After the match, you go back in and there’s celebrations in one corner and commiserations in the other. That was the tradition. Again, because of Elton and how we had developed, he wanted to host that celebration. Windsor was a little bit too far away so we went to John Reid’s house. There was a big marquee at his house in Rickmansworth. It was a fantastic night. There was a band and Elton and Kiki [Dee] played Don’t Go Breaking My Heart. Everybody at the club was invited, with their partners, right down to the laundry lady and the cleaners. It was a fantastic night. What was the thinking behind the family terrace? We wanted to encourage people to bring their children to football because the children are the next generation of adult supporters. If you can get them young you get them for life. I think we were the first side that had a dedicated family enclosure. Graham and I felt that we ought to have an area. The space in front of the main stand was so shallow, it was standing, but we wanted to do something with it. So the simplest thing was to put seats in there. We didn’t have many seats in there at the time. It was Graham who said, ‘Can we create something in there?’ We were talking, ‘What about making it for families?’ Unless you were accompanied by a child you couldn’t go in that area. It wasn’t just myself, Graham and Bertie. The directors were very bright. There was a lot of thinking going on. How could we develop the club? Ann Swanson, what an appointment. She was ex-police and she was a terrific lady. She ran the Junior Hornets. Wonderful. She was the mother hen, really. Over the years, some of it changed, and not for the better. What was your role in signing players? I gather you met the players you were signing and tried to keep them away from Vicarage Road for as long as possible, especially in the early days. [Laughs]. Yes. I remember I took Wilf Rostron on a very nice drive round the villages. It was tricky because you wanted to show the best side of the club and the town to people. I really didn’t like the stadium when I first arrived and I didn’t want it to put people off. The fact Elton was at the club made a difference, though. People wanted to sign. I remember when Steve Harrison was manager we were negotiating with Chester for Stuart Rimmer. Steve rang me from the training ground saying they’d agreed to sell him and he’s coming. But we had to go to Chester. It was a Friday, and we had to get him signed by a 5pm deadline on the Friday. We were going to get a train from Kings Cross. So I got into my car and drove down to London. It was terrible weather and as I came onto the Edgware Road, there was a lorry with bricks on it and he overtook a car in front of me. I was slowing down to 70 miles an hour when all the bricks fell off his lorry. If I’d have been 50 yards further on they’d have been on me. But I had to go over them and through them and bang, crash, wallop. The car was in a state. Both back wheels had punctured, but I kept going for as long as I could. I parked up and I stuck a note on the car and got to the station by taxi and met Steve and he said, ‘Are you okay?’ I said, ‘Oh yes, absolutely fine.’ And off we went to Chester to do the transfer and I sorted out my car later on. Are there any other transfers that stick in the mind? We knew it was Luther and we knew it was the Italians but we didn’t really know who we were dealing with. They said they were from AC Milan. There was a local restaurateur involved. He was a go-between, it seemed. And there were two Italian guys we met up with in a hotel. Were they actually from Milan? Who knows but they were talking on the club’s behalf. They did not want to pay £1m. It was £999,999. Then it was a question of Luther being happy with the terms they were offering him. That took until about 4pm from about 10am. The talks went on and on. It would always start off that they’d give us half now and the rest later. We stuck to our guns. We said we wanted a million and we wanted it now. Eventually we agreed, but saying it and doing it were different things. When it was done the three of us hugged each other and cried. Graham shook his hands. It was a hug. I mean, it was like losing a son, it really was. I went with Luther to Milan for more talks. I went to Milan and for the first time in my life, I was involved with a crowd meeting the plane at the airport to see a footballer. There were hundreds, maybe thousands of them at Linate airport. I remember we met Joe Jordan, who was moving on from Milan and he said good luck to Luther. Then we both flew back, but we wouldn’t release his registration to Milan until we had banked the money. What about the joke that Milan were actually interested in John Barnes? Absolute rubbish. All this talk about Milan signing the wrong player was nonsense, absolute nonsense. They’d been over to watch him a few times. They knew who they were signing. They wanted the top scorer in the English league. I think he had a tough year but he enjoyed it. I heard that he’d not been in Milan long and I think he went out for a meal at a restaurant. It had an open garden. He hadn’t kicked a ball for them yet. He was having dinner and three guys came in with masks and held everyone up with guns. They started snatching handbags and jewels and watches off. Luther was further away and he had time to take his ring and watch off and throw them into a hedge. Within a year you were negotiating to bring Blissett back to Watford. We kept in touch. We’d give him a ring or he’d ring the office. I can remember after the cup final Graham saying there was a chance Luther wanted to come back. Graham thought we could get him back for half a million. I flew out to Rome because the club wouldn’t release his registration, so I had to go to the Italian FA. I went to their offices and it was shut for lunch. I went back later when it was open. I said what I was there for and they said ‘Ok, but you’ll have to come back,’ because the person I needed to see wasn’t there. They closed at 4.30, so I went back at 4pm. I sat there and waited and waited and thought ‘Well, this isn’t going to happen.’ Someone came out of the doorway, immaculately dressed in the most beautiful suit. He had an envelope in his hand. ‘Signor Plumley?’ I said ‘yes’. He handed me this envelope and shook my hand. I thought I had better check it to make sure it wasn’t a blank sheet of paper. But that’s how we got Luther back. Oh Maurice. What a terrific little player but my word a headache. I remember Muff Winwood [Watford director] and his wife went to a London nightclub one night. Muff was in the music industry and he was off looking for musical talent. It’s in the small hours of Saturday morning, he saw this leather-clad, red-haired figure sat at the bar. It was Maurice and he’s supposed to be getting up in the morning to play! He scored two that day. He could stay up all night and play and then he’d go back to his little flat at the top of the road [Vicarage Road] and he’d sleep then, because he hadn’t slept at night. You mentioned John Barnes but that was another big transfer. When John came to leave, Liverpool were really the only club that was seriously interested and everyone knew he was going to go to Liverpool. Arsenal had been interested at one time but I think everyone in football knew he was going to Liverpool. But I said to Graham, if I can slip it into conversation that someone else is interested, I will do. I dropped the word ‘Tottenham’ in when I was talking to Peter Robinson, my opposite number at Liverpool, but they knew I was bluffing. The deal was done fairly quickly after that. It was amazing that we held on to him so long really. What a wonderful talent. Can you remember much about the UEFA Cup games? You must have been quite involved in the administrative side, organising the matches and travel and everything. I remember when we finished runners-up – during that season I was talking in the office one day about what it would take to qualify for Europe. I don’t think people seriously thought it would happen but Graham’s expression was that he couldn’t stop them winning in 82-83, especially at home. You’d been in Europe before hadn’t you? I’d worked in 68 different countries during my football career doing different things so I knew what it was like. At Birmingham we were in the Inter-City Fairs Cup. At Coventry we got into the UEFA Cup. We went to Trachea Plovdiv in Bulgaria. I went to the first draw in Switzerland at UEFA. The pots are up on the table, you see the balls come out and you meet your opposite number and you give them a pack with all the details about your club and they give you a pack. I rang back to the office say it was FC Kaiserslautern. All I got was ‘Oh, okay.’ I don’t think anyone knew what to expect. I used a travel firm I’d used in Coventry who I’d dealt with before to do the travel. We made sure we got a plane chartered and we sold the rest of the seats to the press and fans. Then there would be a trip out to look at their stadium and they came and looked around ours. But it was into the unknown for the club as whole though? It was. It was very exciting and there was a real sense of adventure. I think we all felt very proud that the club was representing English football in Europe and we wanted to make sure we showed the very best of English football. Of course we wanted to win the games too. We had Sir Stanley Rous involved. Sir Stanley had been president of FIFA for a long, long time and he had local connections. I suggested we make him life president of the club. He was a massive figure in football and physically he was an enormous guy. He’d just stepped down as the president of FIFA. He had been a school teacher at Watford grammar school. He had been a referee and secretary of the FA for a long time. Rous came to Sofia [for the Levski Spartak game] and it was very useful because he knew some of the hierarchy there. It was a strange stadium, like a great big concrete bowl, but with very few facilities for us. There was a corridor that went right the way round the stadium. There was a room off the corridor where the directors went and we went in there before the game. We had our own plane chartered to take us back and we were going to fly home immediately after the game so we took our bags with us to the stadium and left them in this room. Anyway, the game went into extra time and we won it [3-1]. When we went back to our room at the end of the game, the door was locked and our bags were left in the corridor. There was no one to be seen. We stood in the corridor for a little while, thinking someone would come along in a minute, but we never did see them. So we went back to the airport to fly home. So, we went into Manchester, then there was a coach for the players and club people and the air stewardesses to travel back to Luton airport. We got back at gone 4am, at least. It was an amazing trip and it meant we got another couple of games. I think we have to accept that Sparta Prague were better than us. Prague was so cold but the warm of the welcome from their directors was fantastic. We always felt very welcome at those European games although you tried not to celebrate too much when we scored. [Laughs] Actually, that reminds me – after the FA Cup final , Graham had won an award from Bell’s [the whisky company] and he was invited up to see Scotland v England at Hampden. They really looked after us and myself and my wife went with Graham and Rita. But my word, to be English at a Scotland v England international is quite something. We sat in the front row of the directors’ box. Graham leant over and said, ‘If we score, don’t stand up.’ When we did score we just there and there was silence all around us. There was just a little block of England supporters celebrating. It was June [actually late May] and it was bitterly cold. And then it snowed. Seriously. Snow in June in Glasgow. You talked about the improvements to the ground and the frustrations of getting things done, but I suppose the Bradford fire did change things because the planning authorities were under pressure to ensure that clubs had facilities that were safe for the supporters. That’s right, although we were confident the Shrodells was safe because we had had it checked by the fire safety people and it had all be sprayed with the stuff that needed to be sprayed on it to stop it catching fire. But it had to come down really. It was an old stand, wooden for the most part, and really not suitable for a First Division club. We had ambitions to improve the ground and so the stand that became the Rous Stand was designed. It’s got a very distinctive roof which gives the ground some character even now. I assume that added to the cost so why did you do it? I think we wanted something that looked nice. We could have just put up a bog-standard roof but we wanted something a little different so that it was ours. They had a similar roof at Newcastle United and our architects were a company from Newcastle. They had a guy called Harry Faulkner-Brown and he was the top guy but he had a couple of younger guys working for him. They were into building all sorts of things but they had done stands at sports stadia and they recommended an architect who was from New Zealand I seem to remember. He produced this blueprint and we liked it immediately. You mentioned Newcastle’s roof design – it’s not there anymore – and they also had a similar looking roof at Coventry’s Highfield Road and Manchester City’s Maine Road, neither of which have survived. Yes, I remember those. I know that the brief was extremely tight and the architects only had a certain amount of space to play with because there was the Shrodells hospital building behind. We wanted to have some executive boxes because we didn’t have any facilities of that kind and we knew we could get some money up front for those. The idea initially was that there could have been a standing enclosure in front of the seated [upper] tier but in the end we put in some temporary seats and then that area in front was seated throughout, as it is now. It was a hell of a job trying to finance it. The club was becoming self-sufficient in the sense that we were trying to operate it without having to go back to Elton for money but there were one or two hiccups trying to finance the stand and in the end Elton came up trumps. We tried to raise money privately but it was not easy at that time. How did it come to be named after Sir Stanley Rous? Sir Stanley Rous – it was an international name in football, he was a Watford man, a school master in Watford. It seemed like the right thing to do if Elton didn’t want it. We put up a plaque in the Elton John Suite. That was the most he would let us do. That was all he would do. Why do you think Elton was reluctant? I think he genuinely didn’t want it to be about him. He knew what he had done for the club and he knew he was appreciated. He didn’t build the club up as a monument to himself. I simply think he felt it was not the right thing to name a stand after him when he owned the club, as he did at that time. Elton is a remarkable person but he didn’t do what he did for Watford for his ego, he did it because it was the club he loved and supported. The thing is, people think he still owns the club, think he is still the chairman. It was nice when you’re signing a player to take him and his wife to the Elton John Suite to talk about his contract. The Minister for Sport opened the stand and Elton was there for the opening. I remember at the time, Elton was having some alterations done to his house. He was having his kitchen re-designed. I remember saying at the opening of the stand that they’d completed the stand quicker than it had taken to do Elton’s kitchen. [Laughs]. Building the stand ended the occasional rumours that Watford were still looking to move. I remember there were all sorts of crazy stories – suggestions of a move to Milton Keynes or even a merger with Luton. And then in 1987 when Elton was trying to sell the club it looked for a while like Robert Maxwell was going to take over and there were more rumours of relocation or a merger. What do you remember? 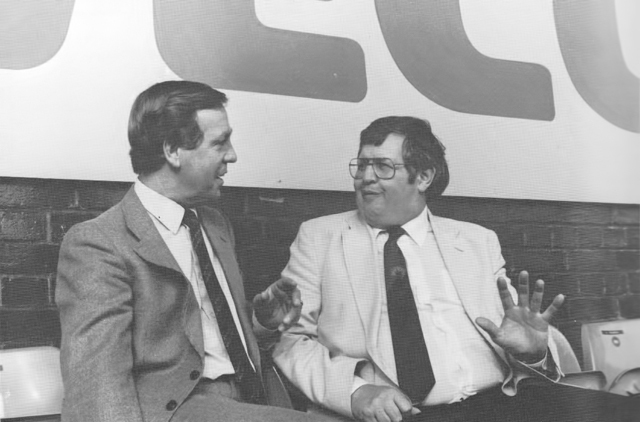 I remember lots of rumours but there was never any truth in the rumours of a move to Milton Keynes or a merger with Luton. There was never going to be a merger or a ground share. No way. There was talk of the ‘golden triangle’ [land on the outskirts of Watford between the M1 and M25] being something that could be developed, and Luton coming to play there but that was never a runner for us at all. The Maxwell thing was more concrete and he did nearly take over, but only because Elton had been advised that it would be a good thing. It was virtually a done deal until the Football League stepped in and stopped it. I think they objected to the fact that between Maxwell and his sons they already owned Oxford and Derby. It wasn’t with the blessing of everybody, not at all. It was just something we were carried away on as the talks went on. Elton was looking to sell and Maxwell was interested and before you know it a price was agreed and it looked like it might happen. Why was Elton looking to sell? I think John Reid [Elton’s manager] was urging to Elton to get out of football. As time went on, his appearances at board meetings were less frequent. He had his own personal problems, but I have to say they hardly ever reared their head when he was around the football club. It was a difficult time for Elton, I think, and perhaps he felt he had done what he could for the club and it was time to become a supporter again. As reluctant as we felt about it, we believed it was a done deal [to sell to Maxwell]. I knew Maxwell through football. He was a very, very imposing guy. He was a bully of a man. The way he walked through a door was bullish. I don’t think he listened to people. He died, didn’t he, in mysterious circumstances. Had he spent the pension money? I think it’s a blessing Watford didn’t get caught up with all of that. I remember going to the Daily Mirror buildings [Maxwell owned the newspaper]. John Reid was there. We were being talked at by Maxwell. We were quite high up in the building. I don’t have a great head for heights, so I wasn’t all that comfortable. Maxwell was eager to tell us all about his six secretaries. The door knocked and he bellowed ‘come in’ and she said ‘you’ve got a meeting.’ He said, ‘Right, well, thank you gentlemen,’ got up and went out of another door. Someone said to the lady, where’s he gone? It turned out he had another meeting. When he opened the door, it was a lift, and instead of going down it went up to the roof. She explained his helicopter was on top of the building to take him to his meeting. I didn’t get a sense he was interested in football, or even Watford, but I think he was interested in power and owning things and particularly things that gave him a profile. Watford was there and he wanted it. I think the fact it was owned by Elton, this global star, interested Maxwell and the fact the negotiations all got into the press was probably not a secret. He liked the publicity. This all happened only a few months after Graham Taylor had left. Dave Bassett had come in and the team wasn’t doing well. It must have been quite unsettling. It was a very difficult time. Nothing about the club seemed to be going smoothly. What do you remember about Graham leaving? I remember we had a board meeting in the block in the corner of the ground that overlooked the pitch. We were in the room with Elton and John Reid went out. Elton sat down and said, ‘I’ve got something to say.’ And he announced that Graham was leaving. They’d accepted an approach from Aston Villa. We had a board meeting the day of the Hearts testimonial for Steve Sherwood. Did you know then that Bassett was coming in? Not at that moment. That was when we were all at the RAC club in London before they headed off to China for the end-of-season trip. Was there a sense of turmoil? Oh yes, absolutely. You just didn’t know where it was going to go. I spoke to Graham after I heard he was going, but it was like the Luther Blissett thing. In my case it was almost disbelief that it had happened. He and Elton were very close. I mean, they had their moments but on the whole they had a great relationship. Sometimes it blew up hot and cold, but the only time I really saw them lose it was in fun really. They’d be playing draughts and the board would go flying when one of them lost. There was a trust between them because they knew that the each wanted the very best for the club. It may well have suited John Reid for the partnership [Graham and Elton] to break up because Elton was trying to get out. Would it be easier for Elton to go if Graham wasn’t there? Possibly he felt that at the time. What did you think of Dave Bassett? It strikes me he and Graham are chalk and cheese in a lot of ways. I have to say I did get on okay with Dave Bassett. I knew he was going to be the manager so it was no good not getting on with him. He was a totally different animal to Graham. He brought in his own staff and I think that made things feel like it had all changed overnight. Did you have to get involved in the hiring and firing that went on? Some of it, yes. The first training day at pre-season at Bisham Abbey. Elton gave me a call and said, ‘will you meet me.’ He said ‘Come to the house and we’ll go up together.’ I went to Windsor. Myself and Elton went up and watched the first training session. We’d had to speak to Billy Hails and let him go, which wasn’t nice. The incoming manager wanted the previous regime cleared out. That was fair enough, really, because every manager wants to either weigh up the existing staff or bring in their own. So we [Plumley and Geoff Smith] had the job of talking to people who had become friends, people who had worked at the club for a long time, and telling them they were no longer required. Elton didn’t do that, Geoff Smith [vice-chairman] did that, with me there with him. It wasn’t very pleasant to do, I can tell you. And it wasn’t very long before something had to be done again because it just wasn’t working with Bassett. When did you realise Bassett had to go? I think we wanted to make sure we had a replacement. Bertie [Mee] had already lined up Steve Harrison. Bertie thought Steve would be the one and the board agreed. He knew the club and we knew him. But there were so many changes and some of the things we’d created in those first six or seven years had suddenly became unraveled. It was like trying to put the thing together again. Why do you think Bassett changed so much, and couldn’t you have put the handbrake on a few things? You have a new manager coming in and you have to let him work the way he wants. There were misgivings about certain things but what do you do? Say, ‘No, you cannot do that.’ You have to trust the man who has been hired to do the job. Having said that, when you think about it Graham, Bertie and I changed nearly everything when we came to the club, and nearly everything worked. I think that is the difference. No one complained when we changed the badge because we were being successful. No one will complain if the team is winning. But if the team is not winning all these little things that go to make up what the club is for people, like the music they run out to, become more important. Nobody had the same Indian sign on things that Graham did. When finally Elton did sell the club it was to Jack Petchey, who wasn’t popular with the supporters. What did you make of him? He ran the club like it was one of his businesses and he did not expect to be covering the gaps and pumping money into it. I know he wasn’t popular but even at the stage in my career, Jack Petchey taught me a lot. He was amazing in an organisational sense. He never said a word to you without recording it by hand. Next day, you’d get a minute with it actioned and my name next to it saying that I was going to appoint a firm to deal with whatever it was. At the end of the month you’d have this great list of things to be done. That thing would remain on the sheet of paper until you did something about it. The list got longer and longer. The relationship was very different then? Yes, it felt like reporting back to Petchey whereas before everyone was much closer. Sure, I kept the directors in the loop about the business side of things and Graham kept them in the loop about players but the directors were always aware of what’s going on because they were more often than not involved in the decisions. Let’s go back to the 1980s, can you remember any players you nearly signed but that didn’t quite come off? In terms of actually sitting down with the player and offering a contract, we sat down with Lee Chapman. We negotiated the contract. He was one we had on a plate. It was at the time Elton was doing a show at the Albert Hall for the Prince’s Trust. Lee and his wife and I was there with Fran [Plumley’s wife], we hosted it in a box at the Albert Hall. We had a Chinese meal with Elton afterwards, but Chapman turned us down and went to Sheffield Wednesday instead. On the last night, Graham let them off the leash a bit and we ordered some wine. They brought it out in those big bottles with long spouts. Well, Eric Steele, who was always immaculate, poured it all over himself, as did Simsy, although he was always scruffy. Everyone was laughing. I would say that the team spirit at that time was so strong. I’m not saying there was never a cross word but it really was a group that was totally together. So let’s come to the FA Cup semi-final where your son Gary ended up playing in goal. What happened? It’s the fairytale story with the wrong ending isn’t it. Tony [Coton] had busted his finger. There was never any chance he’d be fit. Nothing was every discussed in my earshot until the week of the game and it was in the week of the semi-final that the phone in my office rang. ‘Are you fit?’ It was Graham. He told me Steve Sherwood had dislocated his finger. I said, ‘Don’t be stupid.’ But it was true. He’d busted his finger in the last few minutes of training. I rang Gary. He thought I was joking. I thought, well, if he’s going to play, he’s got to be signed on. So, we met at the Moat House hotel in Swindon and I had a Football Combination form, which was enough to tie him to the club. When I got back, I got a call from Graham. Tell Gary to bring his boots and get him to the training ground. I have two sons. Gary could be in this house now and you wouldn’t know. He’s a very quiet lad. My other son, you’d hear him coming. Ian played for St Albans City for a while. Gary was in a sense ideal for a goalkeeper. Nothing fazed him. If he dropped a ball, he would wait for the next one. Outwardly he was no different, but he must have been churning over inside. But he went to the training ground and apparently did alright. Graham and the coaches must’ve thought he’d done okay, otherwise why put him in? When did you know he was playing? I don’t think I’ve ever had such a stomach-churning experience. Going up on the coach I didn’t know what the team was. They were up Stafford way a night or two before, then they moved in to a hotel in Aston. It was because they had been late for the Plymouth game [in 1984] that they did that. Graham didn’t want to take any chances with the traffic because it could be very bad on a big match day. We were in the lounge when the team sheets came round and I remember looking at Fran and she just welled up and started crying. Then to sit through it, and for him to have been involved in one, possibly two of the goals. We didn’t play well as a team but to see Gary in goal and know what he was going through was hard. That was also the match that Simsy [Steve Sims] got taken off with the dislocation. Simsy and Gary knew each other and when he went off I felt for him. Seeing your son play in the side, when it’s totally unexpected, when I never ever thought that would happen was amazing but also very, very difficult. The FA Cup final took some beating. The day after the cup final, the crowds that came out for the bus tour. To stand out on the balcony and see thousands of people there was so special. To feel like we played a part in creating all of that and knowing everyone would have a memory to savour. The nights we got promotion were fantastic evenings. One of the best nights of all, was the last match of the season, when we beat Liverpool, with Martin Patching’s goal [May 1983]. Liverpool were going off from Heathrow for an end-of-season trip. Their flight was something like midnight so they stuck around. We always used to have on the last night of the season a bit of a do with the players, wives, staff and groundsmen. We’d open the boardroom and facilities and have some food and drinks. That night we invited the Liverpool directors and players to stay with us. We contacted them beforehand and told them that we would be staying on afterwards, and we invited them to join us. Someone else then saw the real Watford and another football club saw how we used to do things. We sent one or two of the young apprentices out to get 50 portions of fish and chips from up the road and we stayed for hours. That was what Watford Football Club was all about to me.